For those of you who do not know, a spiralizer is a perfectly unnecessary gadget that makes long strands of varying width out of vegetables. The idea, of course, is that these long strands of vegetables would be the perfect substitute for pasta or even rice (if you then cut up the long strands into very, very small pieces). I did not, not even for the briefest moment, think that long strands of vegetables would be any sort of substitute for pasta, let alone a perfect substitute. That doesn’t mean that I won’t happily tuck into a plate of Zucchini Noodle Bolognese or Carrot Noodle Alfredo. It just means that I will acknowledge and accept the dish for what it is. I stopped pretending when I was 12 (mostly). So…. Why did I buy a spiralizer you ask? One more thing…. I refuse to call them ‘zoodles’ and I only call them ‘noodles’ because no one would know what I was talking about if I called them ‘strands’ or ‘strings’. And if there are zoodles there would have to be coodles and poodles and spoodles and boodles and…..
Spiralize zucchini into spaghetti strands. Heat 2 tsp oil in a large nonstick skillet over medium heat. Add onions and sauté until tender, 6 – 7 minutes. Remove from heat, add good olive oil, vinegar, toss to combine and serve. I’ve only used it twice, both times with zucchini (’tis the season, after all). The first time I just spiralized the whole thing, cooked it briefly and tossed it with pesto. It wasn’t very interesting and the noodles were rather long…. Probably about 6 feet or at least they seemed that long. The next time, for this recipe, I paused periodically and cut them so they were a more manageable length. Plus I added some more assertive flavors. Now I think I’m on the right track. I did, of course, get 2 cook books to inspire my spiralizing. 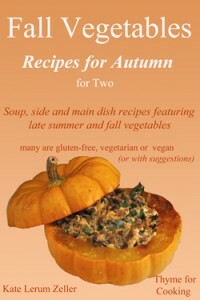 They both have interesting recipes and I’ve gotten wonderful ideas…. But, in all honesty, I can’t recommend them. Well, let me qualify that by saying I won’t recommend them. One of them is a bit preachy – with statements like: ‘You will realize that healthy eating can be enjoyable’. Impose on whom? Someone who enjoys mindless drivel? The other author committed the sin that sends me running, screaming and tearing my hair. Under the recipe for ‘Garlic Aioli’ (which is like saying basil pesto or tomato ketchup) the author states that: ‘Aioli is basically flavored mayonnaise.’ Then goes on to say that one could ‘just add herbs and spices to store-bought mayonnaise but that stuff is loaded with chemicals’. To turn commercial mayonnaise into aioli? Alchemy? I explained the difference between aioli and mayonnaise once (at least) so I won’t do it again. The recipe that follows those comments is neither aioli nor mayonnaise. It’s likely a lovely sauce, but name it something else. That is where the useful words like ‘in the style of’ come in handy. Still, I did get some good ideas. I like how quick and easy this recipe sounds…and well yes, very healthy too! Katie, I’ve been looking at these noodle machines, but not sure that I want to spend $28-50 on one. They all look the same, no matter what the price. Which one did you get? Also, I note that you never seen the most wonderful sauce on earth, oyster sauce. How come? ? Yay, you got one! I just got a new one, and have been spiralizing all weekend – tuna zucchini casserole, apple noodle & tuna salad, zucchini rice with cranberries, goat cheese & walnuts, spiralized sweet potato mac & cheese, tzatiki salad, etc. The best part is that my niece and nephew are visiting, and they’ve been eating everything up like crazy because they think the veggies are pasta or rice! What? No photo of the spiralizer in action?! Oh my, “just add herbs and spices to store-bought mayonnaise” to make aioli? Hahahahahaha That reminds me of the TV cook, James Barber (the Urban Peasant), who once said, “And if you don’t have chilis, use turmeric”. nightsmusic, it would be great on pasta…..
brassfrog, apparently you missed my grilled chicken wings in oyster sauce… Yes I have it.But thanks for the reminder, Mine is a Lurch. k-sam – I just made a chocolate zucchini cake!!!! It has to be great for kids. And we big kids are having fun with it too. I think I’ll try the tuna casserole next, And sweet potatoes. Never thought about apples….. So many ideas…. Elizabeth, what really amazes me is, with such easy access to info on the internet, how ‘food writers’ still get the basics so very wrong. Thanks for the link – I usually like his recipes. Which spiralizer gives you the longest noodles? You have inspired me to try mine. One of my favorite vegetable dishes is made with carrots and zucchini cut into matchstick sized pieces and sautéed in butter and garlic, simply seasoned with salt and pepper. 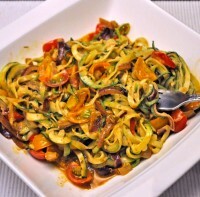 Can’t wait to try this recipe with the spiralizer I have sitting in my kitchen drawer! I love mine for zucchini, squashes, carrots and potatoes…. I put a pile of spiralized potatoes in the oven and they’re crisp and ready in less than 20 minutes! I like your dislike (ha) of the preachiness of some cookbooks. I almost didn’t buy one that turned out to be very useful because I couldn’t stand how self-righteous the author seemed in one of her other books. Not to mention that she went into way too much detail about exactly which body parts would be enhanced by which nutrients – when I’m reading a cookbook, I want it to make me hungry, and comments like “This recipe is so good for the blood-building cells of the pancreas!” have the opposite effect! I need to taste this recipe. I love the spiralizer for zucchini. I have made several different dishes but our favorite is shrimp scampi over the zuddles.